This summer marks a very special celebration for Spur Alliance member Triangle X Ranch. Located in Grand Teton National Park, family-owned Triangle X Ranch is celebrating its 90th Anniversary this year. This historic dude ranch opened in 1926 and has been operated by five generations of the Turner family. This iconic Wyoming dude ranch is known for its authentic American Western vacation experience and has been hosting guests from all over the world. In 1926, John S. Turner brought his family from Utah to Northwest Wyoming to establish a cattle ranch operation. They settled in Jackson Hole, Wyoming – which was a very isolated valley at that time. For the first thirty years, the ranch could only be accessed via miles of gravel and cobblestone roads due to its location. Although the spectacular Wyoming surroundings were beautiful, Triangle X Ranch had to be self-sufficient due to its remote setting. From the very start, the Turners’ friends and family would come to the ranch to help out while enjoying the beauty of Jackson Hole, Wyoming. They would take part in horseback riding, fishing, hunting and other pastimes while assisting with chores. As a result, Triangle X Ranch slowly grew from primarily a cattle ranch to a working Wyoming ranch that hosts guests. Triangle X Ranch remains an authentic working ranch today, with operations overseeing about 250 horses and mules. Today’s vacationers still come to Wyoming’s Triangle X Ranch to enjoy the largest unfenced region of wild open land in America’s lower 48 states. In most years, 70 percent of guests at Triangle X Ranch are repeat visitors. In fact, multiple generations of families have returned to vacation at Triangle X Ranch for more than fifty years. The dude ranch caters to families with its youth and teen programs while offering a full week’s worth of exciting activities and adventures for guests of all ages. Triangle X Ranch is known for its family-friendly dude ranch experience which includes traditional wilderness pack trips, world-class high country big game hunting, fishing and scenic float trips on the Snake River, as well as winter getaways for skiing and snowmobiling. Dude ranch guests stay in individual historic log cabins on the property and enjoy family-style meals in the ranch’s main lodge. 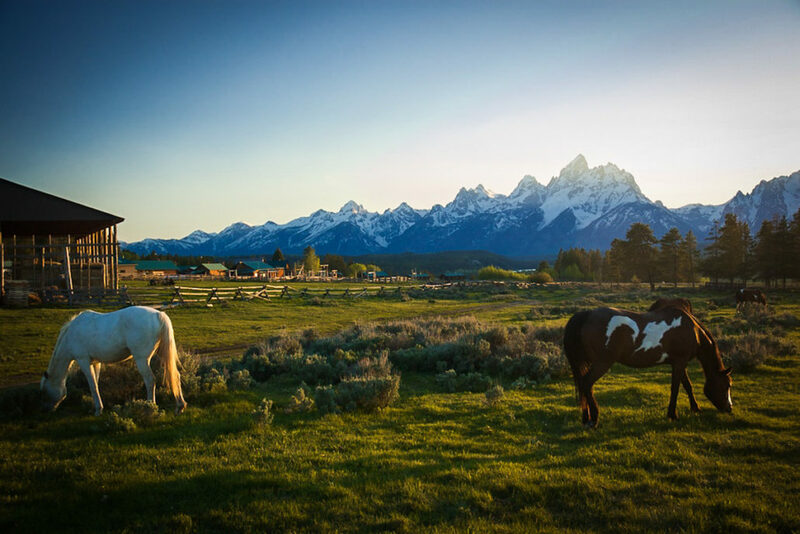 Guests enjoy the opportunity to reconnect with each other and pursue a wide variety of adventure activities surrounded by the stunning scenery of Grand Teton National Park. Beautiful Yellowstone National Park is also located close by. The Spur Alliance congratulates Triangle X Ranch on this landmark milestone event. Happy 90th Anniversary, Triangle X Ranch!